This is an excerpt from my book Principles of Prayer. 1. Authority to pray for the lost. Since God desires all people to be saved (1 Tim. 2:4) He must also want us to pray for their salvation. Here are three things that God desires us to pray for the lost: (1) that their hostility or indifference for the gospel would be broken down and that God would grant them repentance (2 Tim. 2:25); (2) that the soil of their hearts would be prepared for the seed of the Word of God so that His Word would not return void, but would accomplish what He desires (Is. 55:11); and (3) that they may be liberated from the power of Satan—delivered out of darkness and into God’s marvelous light (2 Tim 2:26). These are just a few things we could pray for the lost. I would encourage you to claim in prayer all of the verses you can find concerning salvation for the lost. There are tons of them. Pray especially those verses that God seems to lay on your heart. Remember that without the Word you really can’t pray with authority. The Word and your trust in the Word is the foundation for your authority in prayer. 2. Authority to witness with power and boldness. Before you make plans to witness, that is, before you leave your house in the morning intending to witness to someone, I think it is always a good idea to pray over the three points that we just mentioned. Then, as you go, you can be confident that He will lead you to those people you have prayed for—those people He has chosen to save. Most of the people we witness to will not be ready to receive Christ. Our witness to them will be primarily to break down their indifference to the gospel. But to some, maybe just a few, God will have worked to prepare their heart, and they will be ready to hear and receive the gospel. After we have prayed, our second responsibility is to share the gospel, and to do it with authority, power, and boldness. Can we do it? Yes we can if we trust God to help us. He has already put His Holy Spirit in us to give us power. As Jesus gave His disciples power to witness He also has given us power. And He says to us, “But you shall receive power when the Holy Spirit has come upon you; and you shall be witnesses to Me in Jerusalem, and in all Judea and Samaria, and to the end of the earth” (Acts 1:8). But note that our power and authority is not to save, not to convert; just to witness, and to preach—to have boldness to preach the Word of God clearly. God saves the souls of the lost when He draws them to Himself (Jn. 6:44) and when they decide to believe in Him. Thus, as the Bible says, “He who believes … will be saved; but he who does not believe will be condemned” (Mk. 16:16). And so, we do not have authority to save, only to preach. As Jesus said to His disciples He also says to us: “Go into all the world and preach the gospel to every creature” (Mk. 16:15). Another passage I like is in Matthew 28:18-20. Here I believe it is clear that on the basis of the authority of Christ (because He has been given authority in heaven and earth), we, just as the disciples, are sent out to witness and make disciples. That is, because Jesus dwells in us, and because we (the church) are His body, we have the authority and the power to witness and make disciples. I think it is true that our authority in Christ is energized in all areas of life when we are obedient in all areas, especially in this area of making disciples. I would guess that the reason many believers are stagnate and just don’t have much joy and much of the power of the life of Christ in them is because they have disobeyed God in this area of making disciples. It is something He calls us all to do. Therefore we must step out in faith and just go—go and share the gospel! And we should also make it our intention to make disciples of those we share with, that is, to teach them all the things that we ourselves have learned from Him. That is our goal in witnessing. And we have the promise from Jesus that, as we go and witness and make disciples, He will be with us always, to comfort us and empower us with boldness (Matt. 28:20). Remember that besides giving us power in witnessing, God also gives us power in prayer over the devil and to live righteous and holy lives. For in Christ we have authority over all the power of the enemy. You may remember that when Jesus sent out His seventy disciples, two by two, to go and witness with authority (Lu. 10:1), “[they] returned with joy saying, ‘Lord even the demons are subject to us in your name’” (Lu. 10:17). “And He said to them, ‘I saw Satan fall like lightning from heaven. Behold, I give you the authority to trample on serpents and scorpions, and over all the power of the enemy, and nothing shall by any means hurt you…’” (Lu. 10:17-19). Friends, has not Jesus given us this same authority if we abide in Him? Go, therefore, and pray and witness and make disciples in His name. 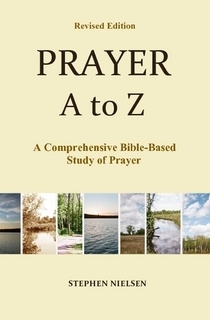 This entry was posted in Authority in Prayer, Prayer A to Z Excerpts, Reblogs and tagged Authority in prayer, God's Power, power of prayer, prayer. Bookmark the permalink.